1. For the beef filling: sweat the shallots with the garlic, chilli and ginger in a pan over medium heat and with a little oil, for about 10 minutes or until shallots are soft and slightly caramelized. Remove from the heat and allow to cool completely. 2. Mix the cooled ingredients in a bowl with the vinegar, groundnut oil, grapeseed oil, soy sauce, sugar, salt and the steak. Cover and place in the fridge for at least 2 hours. 3. For the buns: using a stand electric mixer fitted with the paddle attachment and on a low speed, mix together the flour, sugar and baking powder. In a separate bowl, and using a fork, whisk together 200g lukewarm water, the double cream and yeast, until well combined. Pour the wet ingredients into the dry ingredients and mix on medium speed until the dough comes together. Switch the paddle for the dough hook and knead for approximately 5 minutes on medium speed. Then transfer the dough to an oiled bowl and cover tightly with clingfilm. Allow to stand at room temperature for 30 minutes. 4. Meanwhile, finish the beef: heat a frying pan over high heat, add a little oil then add the strips of beef, being careful that each piece lays flat on the bottom of the pan. (This will give you an even cook and maximum flavour as the beef caramelizes in the pan.) Once pieces are in the pan leave for 2 minutes. Using tongs, turn the pieces over and leave for an additional 2 minutes. Remove the beef from the pan and place in bowl ready to fill your buns. 5. Roll the dough into a uniform shaped log, approximately 7cm in diameter. Cut into pieces measuring 5–6 cm wide. 6. Press the dough into a flat oval, measuring approximately 0.5cm thick. Brush both sides of the bun with a little oil and fold in half width-wise. Place on an oiled tray. Cover with clingfilm and place in a warm place for approximately 90 minutes or until they double in size. 7. If using a bamboo steamer, soak in water for 30 minutes. Place the steamer over a pan of simmering water. Line the bottom of the steamer with parchment paper that has been perforated. Place the buns inside the steamer (the steamer can be up to 2 layers tall). Place the lid on top and cook for approximately 15 minutes. Transfer the buns to a tray, slightly unfold the buns and cover with aluminium foil. 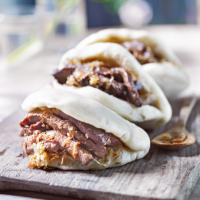 8 To serve, tear open the cooked buns along the fold and fill with the beef and shallot mixture.